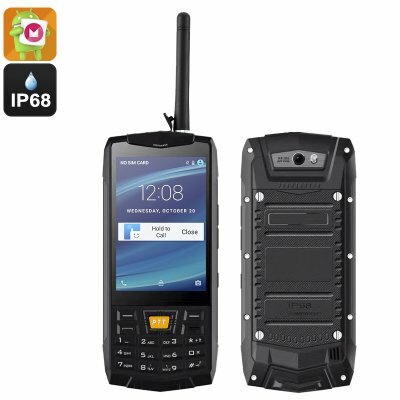 Successfully Added Rugged Android 6.0 Smartphone - Android 6.0, Quad Core CPU, Walkie Talkie, SOS, Keypad (Black) to your Shopping Cart. Adopting a classic cell phone layout this IP68 rated rugged Smartphone is the ultimate in survival phones and features a full keypad to go alongside its 3.5 inch IPs screen. This means you can use it with your gloves on and even when the phone is wet or dirty the keypad will still respond perfectly letting you dial numbers type messages and interact with the phone in full. Fully protected from water and dust ingress and built to withstand submersion in up to 1meter of water for as much as 30 minutes this rugged Smartphone removes the barriers and constraints of regular Smartphone as it can accompany you on even the wildest adventures. The 3.5 inch IPS touch screen brings the Android system to life letting you surf the web, watch video clips and even enjoy games and with the Google Play store accessible you can enjoy all the latest apps on offer. Underneath the rugged exterior is an effective yet every efficient Quad-Core MTK6580 CPU that has been clocked at 1.2GHz and is accompanied by 1GB of RAM so there's more than enough power to run all your daily tasks. With 8GB of built-in storage and a micro SD card with 32GB support, you'll not be short on storage space allowing you to stock up on games, apps and store a multitude of pictures. Perhaps the greatest feature of this phone is its walkie-talkie function. Just select the frequency you wish to communicate on, between (403 to 470 MHz) and when you have the antenna attached you can chat away using the push to talk (PTT) button. a great way to chat without any cost and ideal for those camping or trekking holidays off the beaten path where there's no cell phone support. Due to a substantial 2700mAh battery and efficient build, there is plenty of life from every charge. This rugged phone also enjoys a 5MP rear camera you can capture all the fun in great detailed pictures or high-definition video. 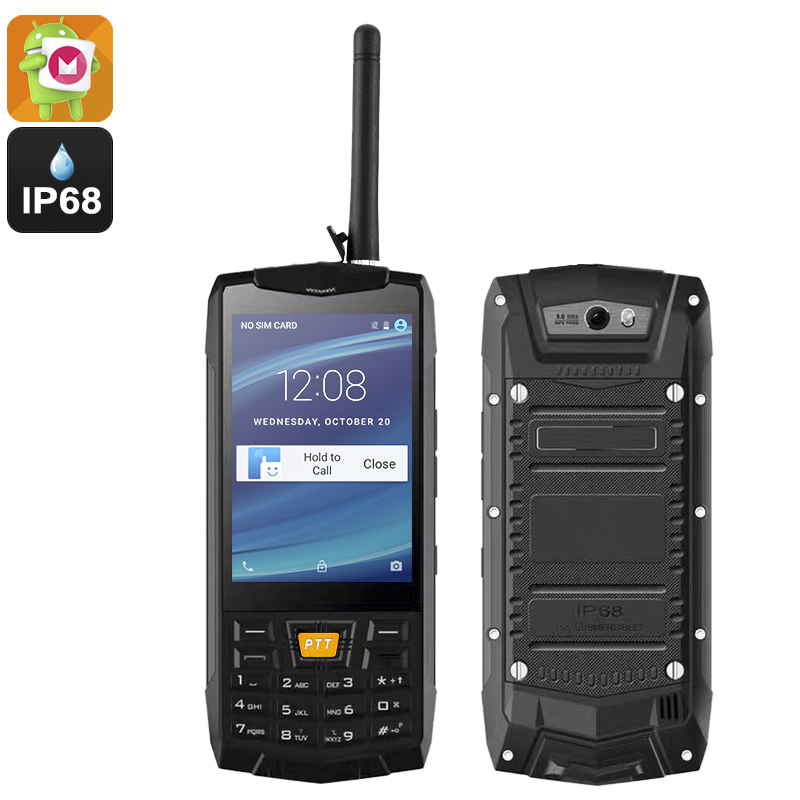 This IP68 rugged Android Phone comes with a 12 months warranty, brought to you by the leader in electronic gadgets as well as wholesale Android phones..
Arabic: - وعرة ستريك 6.0 - Chinese Simplified: - 坚固耐用的 Android 6.0 智能手机 - Czech: - Odolný Smartphone se systémem Android 6.0 - Dutch: - Ruige Android 6.0-Smartphone - French: - Robuste Android Smartphone 6.0 - German: - Robuste 6.0 Android-Smartphone - Hebrew: - החכם 6.0 אנדרואיד מוקשח - Hindi: - बीहड़ एंड्रॉयड 6.0 स्मार्टफोन - Hungarian: - Masszív Android 6.0 okostelefon - Italian: - Robusto Smartphone Android 6.0 - Japanese: - 6.0 の頑丈な Android スマート フォン - Korean: - 견고한 안 드 로이드 6.0 스마트폰 - Malay: - Lasak 6.0 Android telefon pintar - Norwegian Bokmål: - Robust Android 6.0 Smartphone - Romanian: - Rugged Android 6.0 Smartphone - Russian: - Прочный Android смартфон 6.0 - Spanish: - Resistente Android Smartphone 6.0 - Thai: - ขรุขระโฟน 6.0 - Turkish: - Engebeli 6.0 Smartphone Android - Vietnamese: - Gồ ghề Smartphone Android 6.0.